Mechanical Edge-O-Dock levelers are operated by placing the actuation handle into the pocket of the inner lip and pulling down toward the floor. The operator then pushes the handle forward until the lip rests on the truck bed. As the trailer departs, the lip retracts behind the bumper face automatically. The Edge-O-Docklevelers permanently attach to the face of the dock. These are recommended for docks at least 48” high. Concrete recess is not required. Details: Service range of 5” up and down; and 2” x 8” x 18” bumpers; standard ramping length of 27”; overall width is Usable width plus 26”. 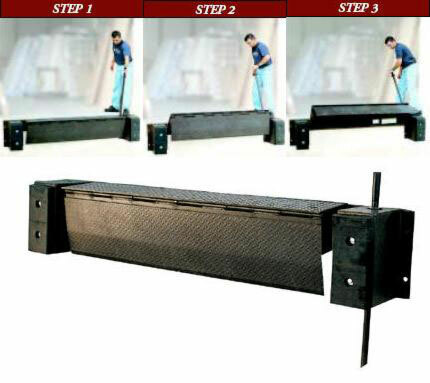 A steel dock edge, optional approach plate, or approach ramp is required for proper installation. Available in 48” 6,000 Capacity, 66” 20,000 Capacity, 72” 20,000 Capacity, 66” 25,000 Capacity and 72” 25,000 Capacity.